C has fond memories of growing up in Oratia, West Auckland which is about a half an hour drive from the CBD. The area is what you'd call semi-rural, semi ruggard and C's family home overlooked a native bush covered valley in the Waitakere Ranges. A world away from the urban jungle I grew up in, in Hong Kong! One childhood memory C particularly likes recalling, was how one year C's mum planted a massive bush of coriander. When the bush was about to go to seed, C's mum made a humongous jar of coriander pesto which sat in the fridge for about 2 seconds before C and his two older brothers demolished the lot. So the other week, when I saw massive bunches of coriander on sale for NZD$3.50 in a little Asian vege store in Newmarket I couldn't resist grabbing a bunch with the idea of surprising C with a big jar of coriander pesto. 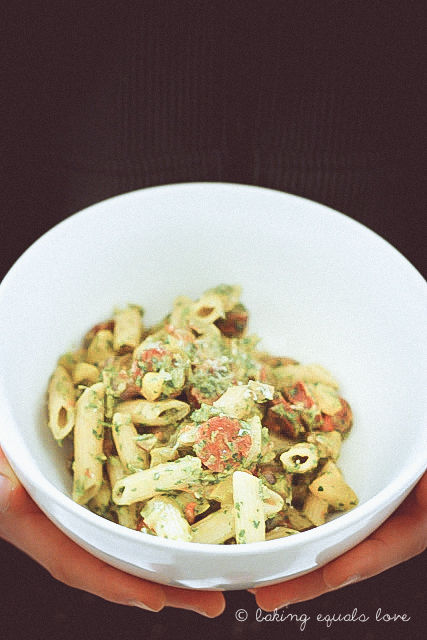 The pesto is super easy to make. Just whizz up the coriander with loads of garlic, olive oil, a splash of red wine vinegar and sliced almonds. The red wine vinegar was completely accidental, I thought the vinegar bottle was the olive oil bottle. A happy mistake though, the vinegar gives just a little bit of tanginess to cut through the coriandery flavour. The almonds were just sitting in my pantry, so feel free to substitute with cashews or pine nuts. We had the pesto on pretty much everything, on toast, a dollop in soup, even mixed through yoghurt to go with an Indian curry. 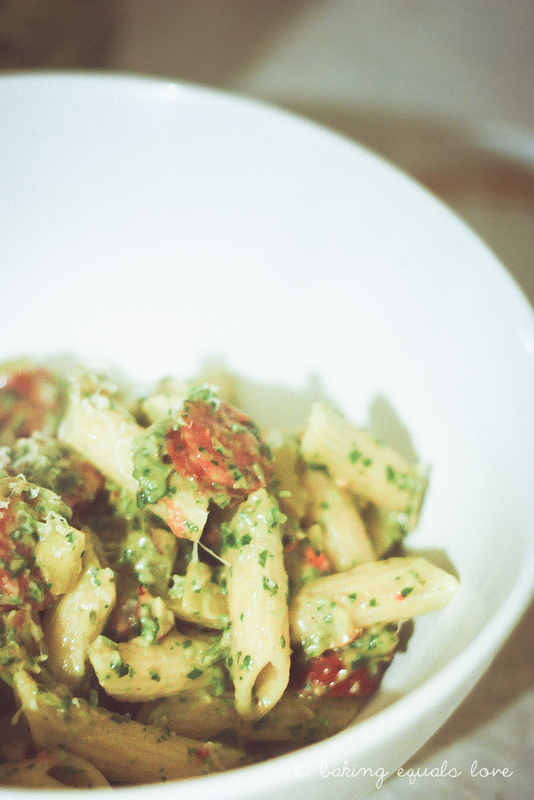 It would also be great as a dip and of course in a quick and easy pasta dish with chorizo. 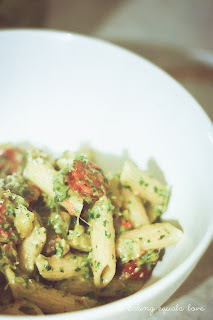 All credit for the pasta recipe goes to C though, since it was his idea to use it in a pasta - thanks C! *Chinese or Japanese eggplant is long and narrow with a paler purple skin. You can use normal eggplant. In a large pot of boiling salted water, cook the penne pasta to the packet instructions until al dente. While the pasta is cooking, heat some oil in a pan and cook the garlic and chorizo on medium-high heat until fragrant. Add the eggplant and cover for a few minutes to soften the eggplant. Add chilli flakes, tomatoes and capsicum and cook for 2 minutes. Drain penne and add to the pan. Add pesto and Parmesan and stir through. Squeeze in lemon juice. Serve with a side salad like a rocket salad with lemon olive oil dressing. In a food processor, blitz the almonds, then coriander and garlic until all chopped into little pieces. Add oil while the food processor is going until the mixture looks wet but not soupy. Add salt and black pepper to taste and a splash of red wine vinegar. Keep in a large jar in the refrigerator. Our massive jar lasted in our fridge for 2 weeks before being completely devoured. Yum! I'm going to have to try that next year. So do y'all call "coriander" the whole plant, all the time? In Texas "coriander" is the seeds and "cilantro" is the leaves before the plant bolts.